(42) Mens Vintage 70s Leisure Jacket! Corduroy w/ Zig Zag Chocolate & Caramel Stripes! 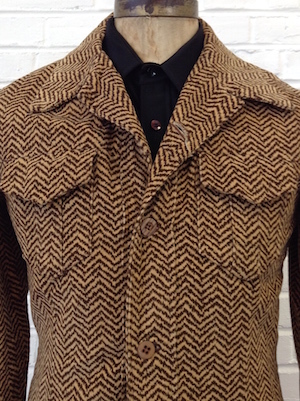 Home > Vintage Jackets > All Vintage Jackets > (42) Mens Vintage 70s Leisure Jacket! Corduroy w/ Zig Zag Chocolate & Caramel Stripes! Mens vintage 1970s disco leisure jacket! 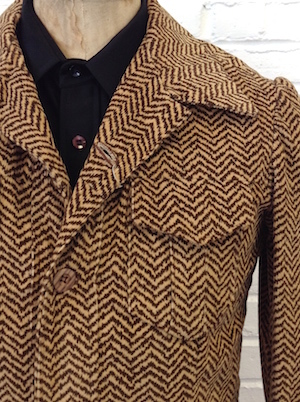 Funky fresh corduroy jacket in a chocolate and caramel zig zagging stripes! 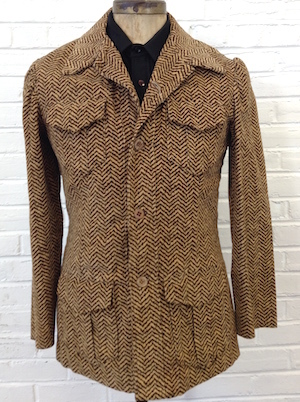 Super wide 70s split lapels, four wooden looking buttons in the front.buttons in the front. Four front pockets with flap closures in the front. No material tag but feels like a cotton blend. Condition: Very Good. One button has been replaced and has a little fraying on the interior of the cuffs. Does not detract from the awesomeness of this jacket.